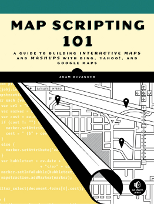 Programmable Web's Adam Duvander has written the definitive guide to Mapstraction in Map Scripting 101; available from the US and UK Amazon stores. Code your application once and once only; then switch your mapping provider as you desire, depending on your personal tastes, the quality of maps in your area or any other reason you can think of. Switching mapping providers in Mapstraction is often as simple as changing just two lines of code in your application. Mapstraction is an open source project with the source code freely available from GitHub and is released under the BSD License. Development of Mapstraction has been made possible by the generous support of Nestoria, the San Jose Mercury News, MapQuest, the Los Angeles Times and IDELab and many helpful developers and users.